Soon: Greta the Gremlin Life Size Stunt Puppet Prop Replica! You are here: NECAOnline.com » Licenses » Movies » Gremlins » Soon: Greta the Gremlin Life Size Stunt Puppet Prop Replica! That hair! Those lips! That scaly green skin! There’s only one Greta. …And boy, is she beautiful. Our latest Gremlins stunt puppet prop replica has the honor of being the only female Gremlin ever to appear in either of the movies. That’s right folks, it’s Greta. 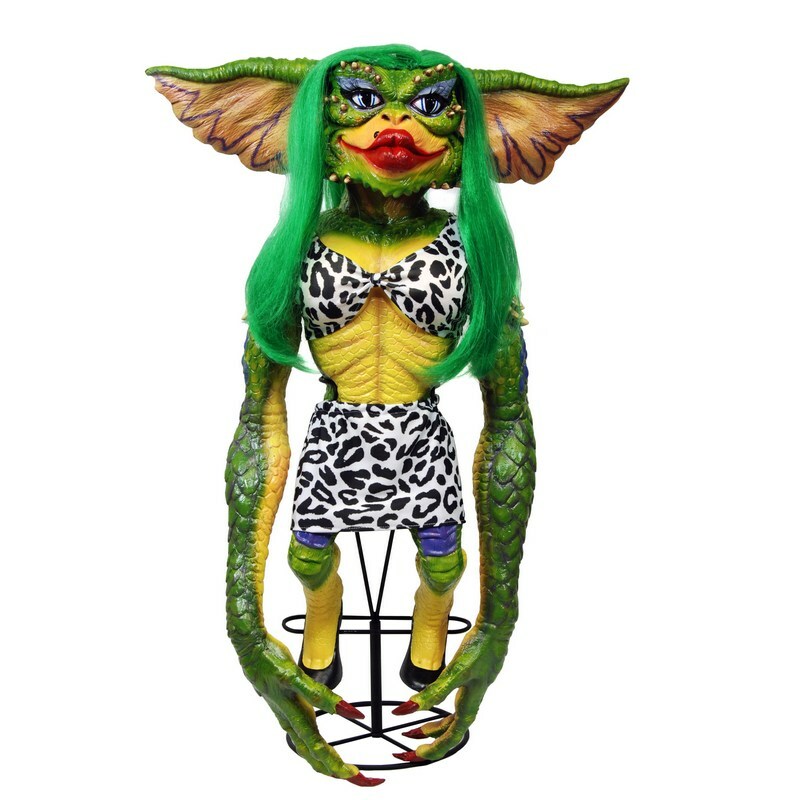 With flowing green hair, puckered-up kissylips and fingernails desperately in need of a manicure, our Greta stunt puppet prop replica is an exact recreation of the she-Gremlin’s appearance in the movie. We even got the leopard spots on her dress! Based on the original film puppet as seen in Gremlins 2: The New Batch. This rubber and latex figure stands nearly 30″ tall and features fake eyelashes, a bright green wig, tailored clothing, and high heeled shoes, she is frighteningly beautiful. Hand painted and comes complete with metal display stand. Prop replicas are awesome, but don’t forget our Gremlins and Mogwai action figures! Head of Product Development Randy Falk recently Tweeted an update about the forthcoming Mogwai Series 3 and they’re just the latest in our ongoing Gremlins line. These action figures and the prop replicas are truly something special, but they’re only part of the story. The Gremlins cult continues to grow, and we’re not slowing down anytime soon! We’ll keep coming with the best figures and other items from the Gremlins movies. Until next time, check out the full NECA Gremlins line, and let us know what you think of the lovely Greta on Facebook, Twitter or G+!